Jane Steele studied textile marketing in England, and worked with many European mills supplying the UK garment industry. 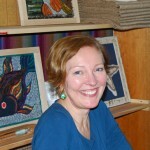 Moving to Nova Scotia in 2010 Jane started to plan a way to put her knowledge and love of colour, fabric and design into a business. She learned how to hook and quickly became “hooked”.